I am very pleased to write a few words about taimen fishing in Europe for my friend Mikhail and an international, probably Russian-dominated readership. I have visited Russia several times, in search for big, long rivers unaffected by human impacts, and fishing for Siberian Taimen. A species closely related to the Huchen or Danube Salmon (Hucho hucho), a fish that occurs in my home country of Austria. It was fascinating to find natural stocks of Siberian Taimen in pristine environments of the Russian Far East and Central Asia. The other way round, maybe it is interesting for you to read about a nearly similar fish, living in very different surroundings here in Central Europe. 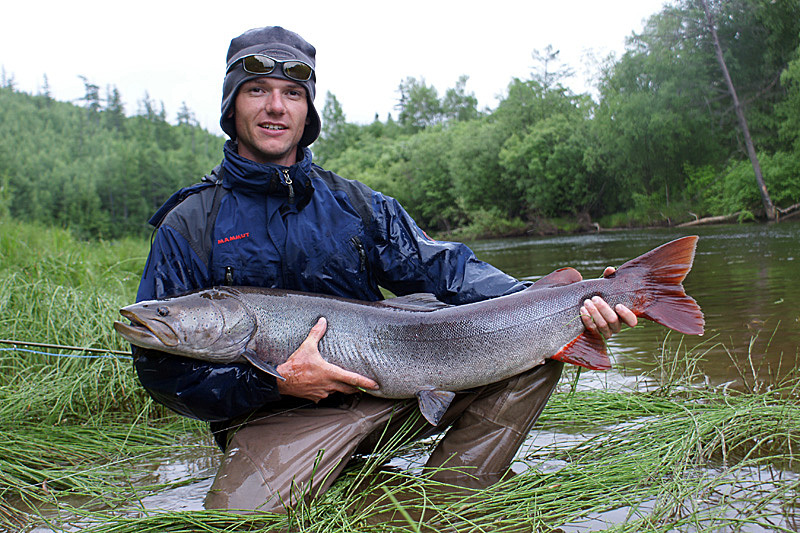 The author with a beautiful Siberian taimen from Bichi River. Have a look at the intense red colour of the rear fins! Taimen and Huchen are very closely related, some scientists even consider them as subspecies of one fish. 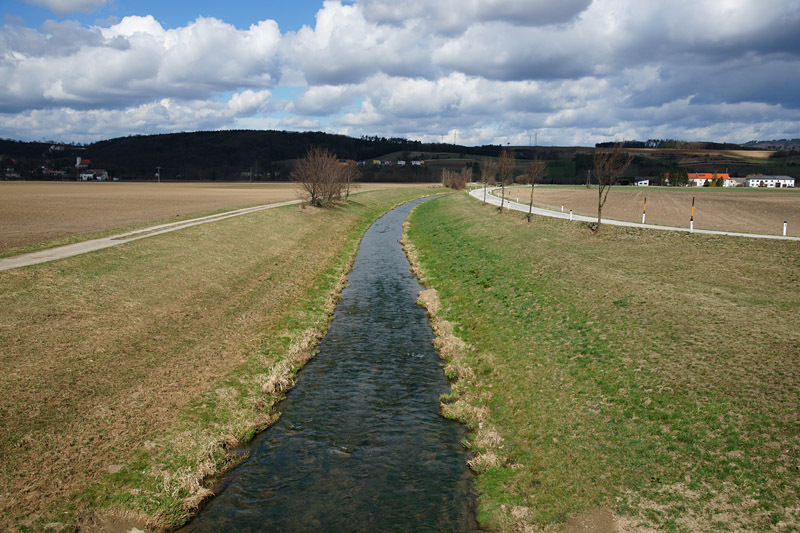 The European version of Taimen occurs only in the drainage of the Danube river, in — for Russian standards — tiny countries such as Bavaria (part of Germany), Austria, Slowakia, Slowenia and Bosnia. The distribution of Siberian taimen reaches (or reached?) only slightly to the European continent in a few rivers of the Polar Urals (Pechora dainage) and upper reaches of Kama, a tributary of the Volga. It is a miracle that such almost identical fish live in areas so far away. Because those two species are so similar that except their distribution, scientists were not able to find any single external character that separate the two fish. With the exception of the coloration of the rear body third and unpair fins, which is usually more intensely red in Taimen than in Huchen. In my home country of Austria, the range of Hucho has collapsed to a small part of the historical distribution — in fact less than 10 %. But unlike in Siberia, not intensive fishing but destruction of the habitat is the main factor for that drastic decline. Regulation of rivers and series of dams and impoundments of hydroelectric powerplants are the main problems now. Water pollution has been cleaned up in the last decades by sewage plants. 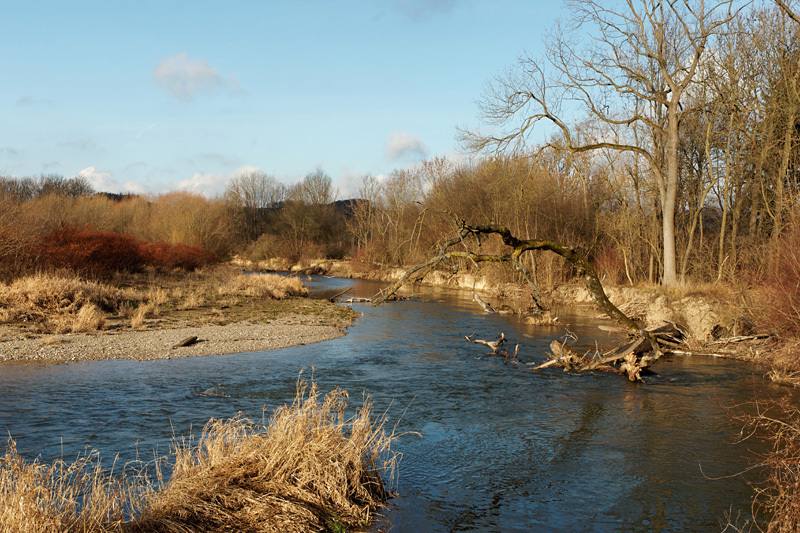 Here in Austria, we now have only two remaining rivers with naturally reproducing population of Danube salmon, totally approximately 2500 adult individuals. 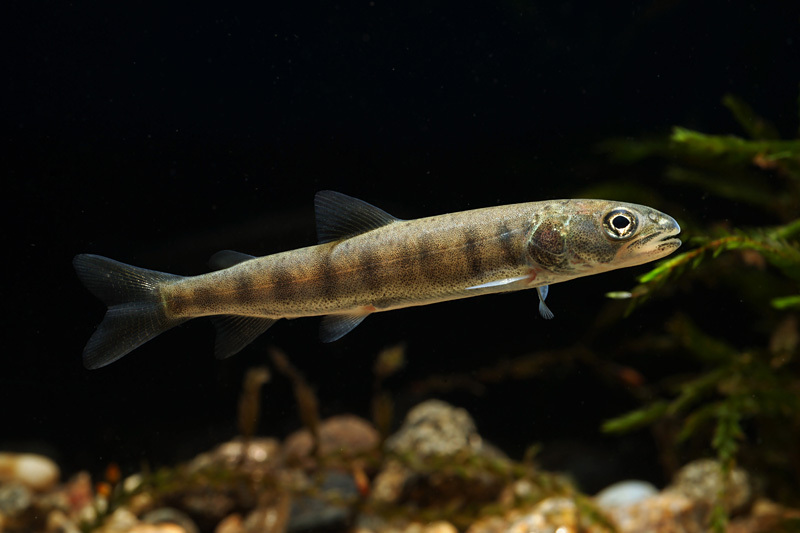 In some further rivers, artificial reproduction and stocking maintain populations of this great fish, because spawning areas in swift water and good habitats for juveniles have been destroyed. 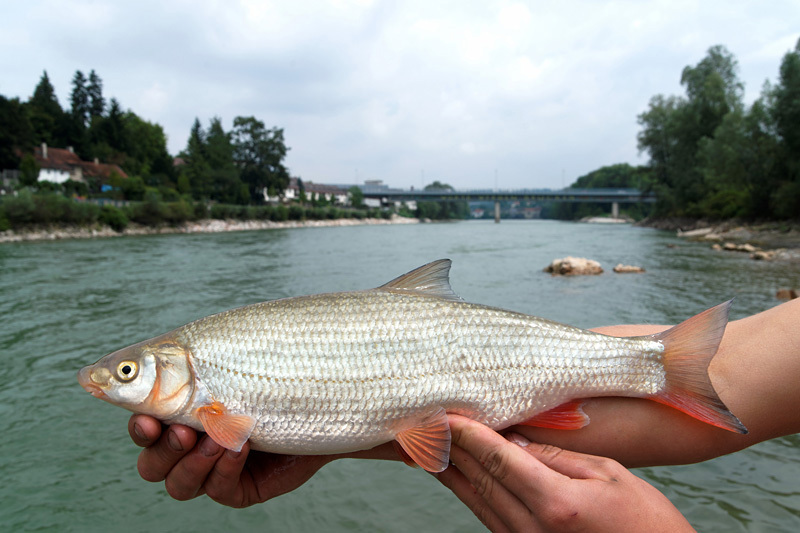 Fortunately, discipline of fishermen and surveillance of the rivers is efficient enough, so that in the remaining habitats an attractive fish like Huchen can survive even in such densely populated and fished countries as Austria. 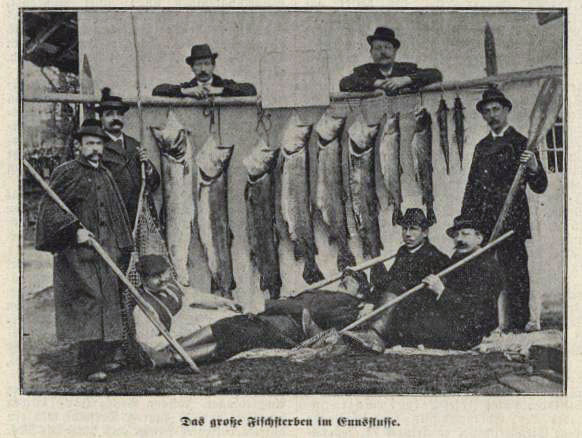 This picture of a fish kill in River Enns after an accident with acid in the year 1902 shows how great fish stocks were in historic times (Stadtarchiv Steyr). Huchen need clean gravel to be able to reproduce successfully. 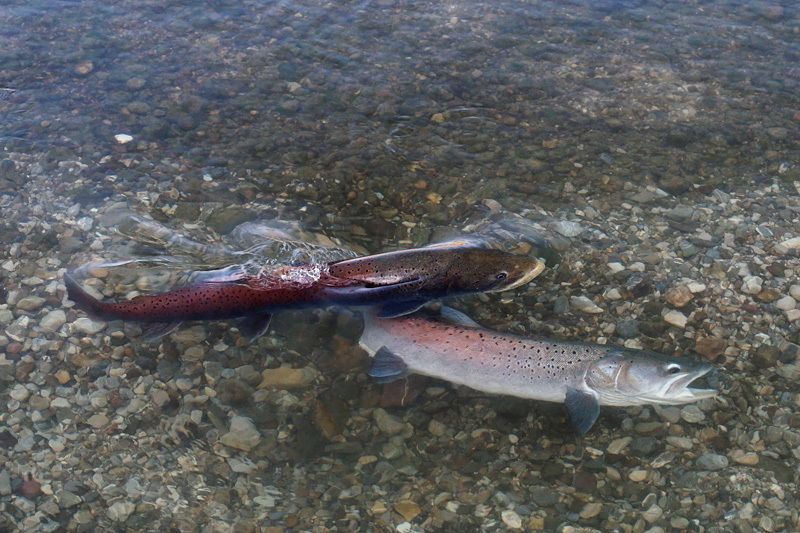 The upper fish is a male – during spawning season their colour changes from silver or light copper to darker red. 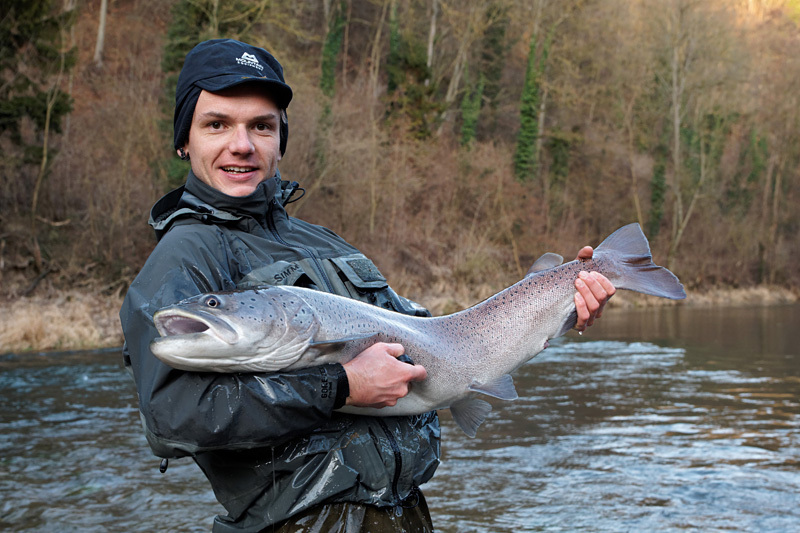 Maximum size of Danube salmon is somewhat smaller than in Siberian Taimen. A doubtful historical source from the year 1897 states two record catches of 60 kg fish. But a historical maximum size of 50 kg and 1,60 — 1,70 m is definitely realistic. Nowadays, a fish of 15 kg is large, 20 kg is exceptionally big, but still single fish up to 30 kg are caught every few years. Due to our warmer climate, 15 to maximum 20 years are sufficient for Hucho hucho to reach such big size. In some lowland rivers, Huchen can grow up to 20 cm long already in the first year. The longer growth phases in our temperate climate, compared to the winter-cold continental climate in the range of Siberian Taimen, is the main reason for this. 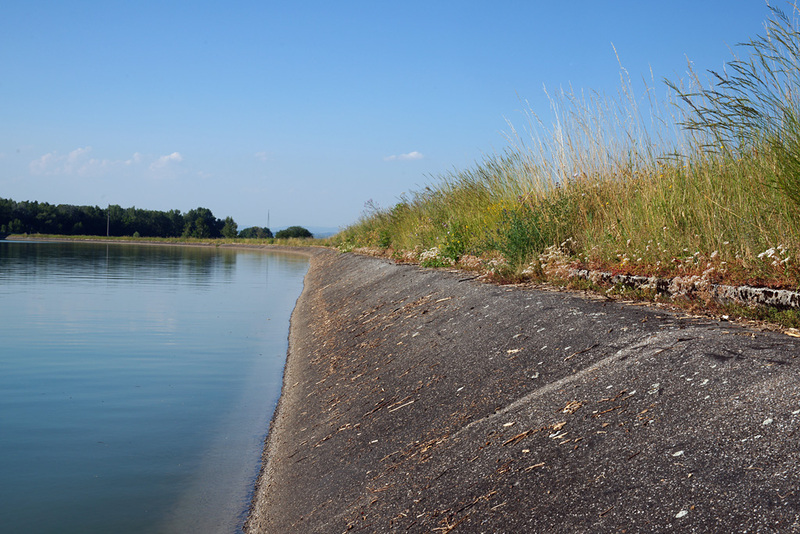 Historically, the Danube Salmon occurred mainly together with a bunch of cyprinid fishes such as nase, Chondrostoma nasus and barbel, Barbus barbus. These fish accomplished long migrations from the big Danube river to spawn in smaller tributaries. 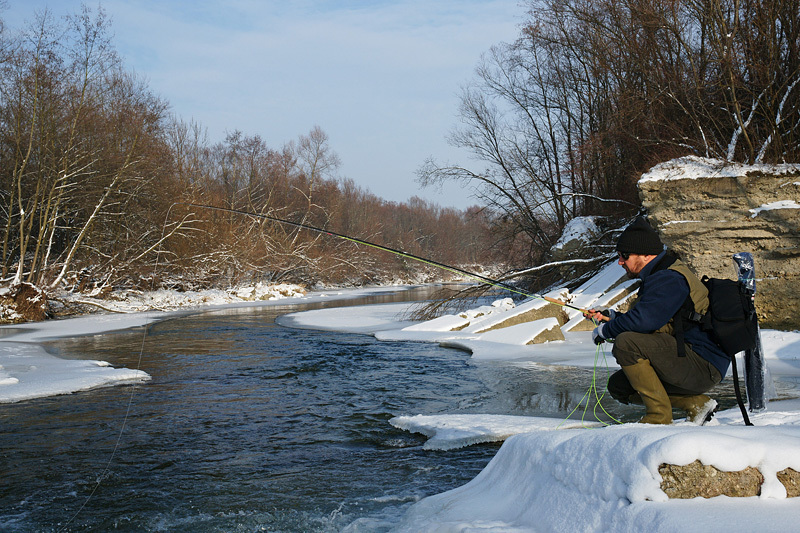 Nowadays Huchen live restricted more to the upper river regions, accompanied by grayling, Thymallus thymallus, and brown trout, Salmo trutta. 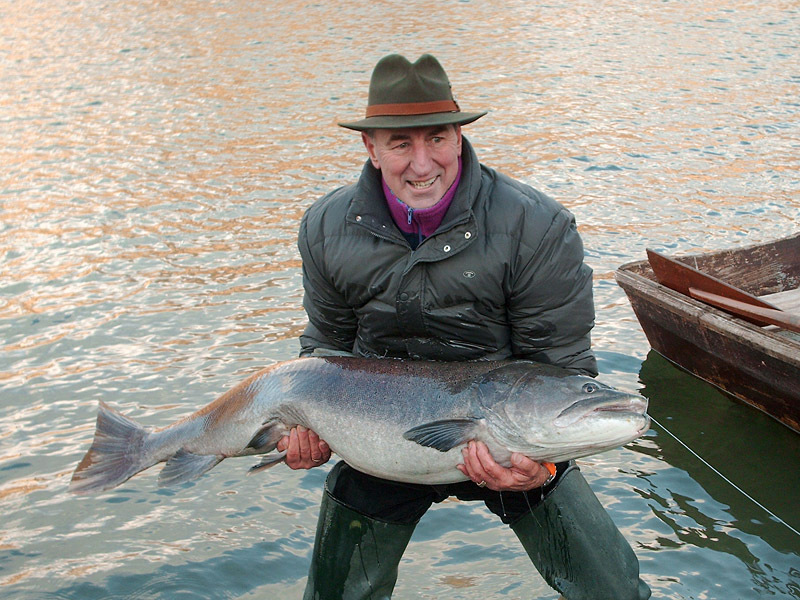 Fly-fishing for Hucho is more popular than in Russia, but somewhat freaky also here in Austria. In fact fly fishing and big predators feeding on big prey seem kind of contradictory, because casting big flies is rather difficult — it requires good skills and well-adjusted gear. But in my personal opinion, it can be actually more efficient than spinning, especially in small to mid-sized rivers. Because flies move in a more realistic way than artificial spinning baits. And Huchen don’t already know the order number of a fly in the fishing gear catalogue, as they maybe do in case of the popular rubber fish, wobblers or spoons. Last but not least, fly fishing gives me much more fun and satisfaction even when catching nothing for days and days — which is more the rule than the exception. 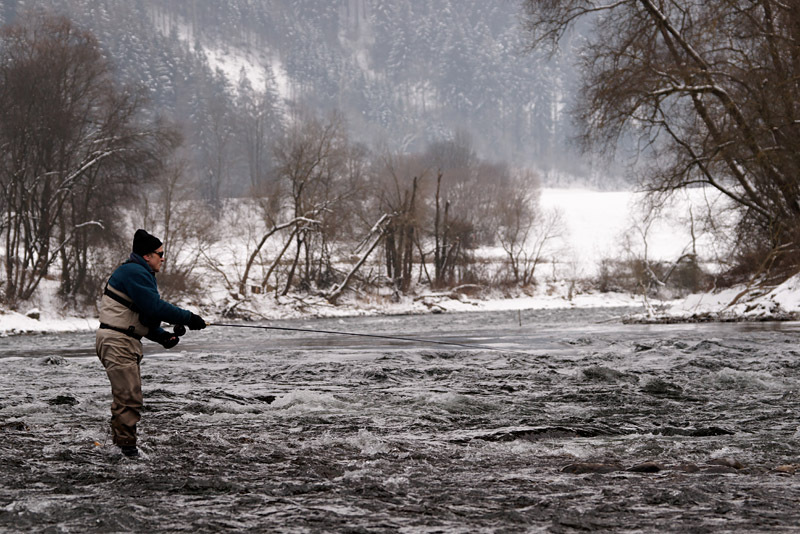 Unlike in Russia, the season for Hucho fishing is mainly late autumn and winter. Spring and Summer is closed season. 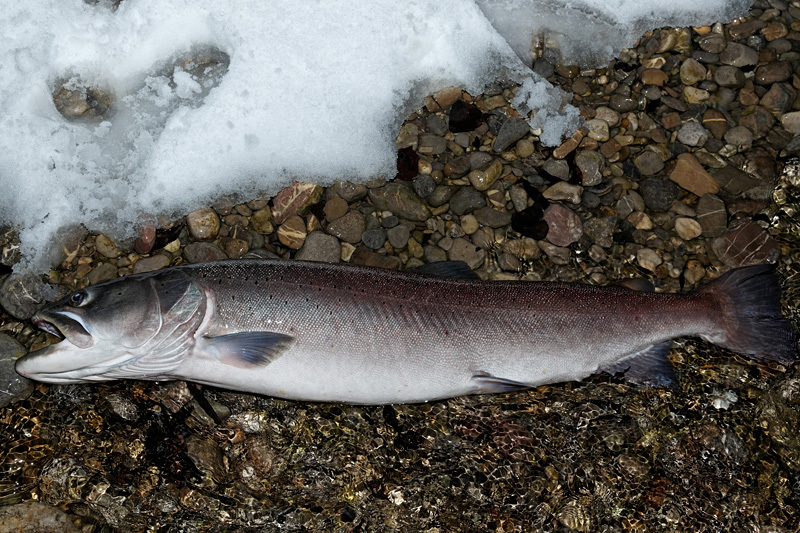 There is some debate why it seems easier to catch Huchen in winter than in summer. Mostly rivers don’t freeze up. Prey fish hardly feed, concentrate in wintering areas and are less easy to catch for the predators. So, the hunting and feeding period lasts longer, before a saturated Huchen will swim back into its lie to ignore even the most beautiful fly or natural prey for days or even weeks. Huchen spawn in April or May, so they have to feed also in winter to be fit in spawning period. Last but not least, it can be easier for the fisherman to foresee the hunting periods in winter. I presume that Huchen feed mainly at dawn and night in summer, but more during daylight in winter. After cold periods, a sudden change to warm weather is the time when we head to the river. Or dense snowfall after days of bright sun. 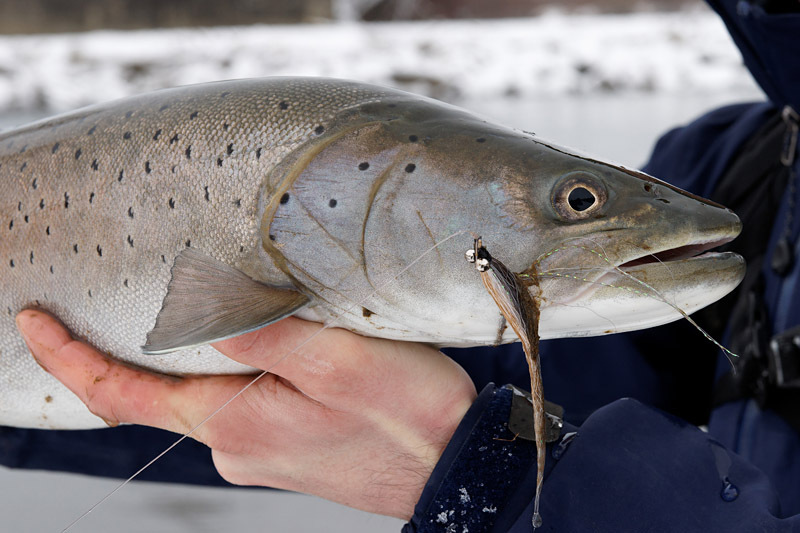 You could fish for weeks without a single bite, but catch several fish in a few hours if you are lucky to guess the feeding time. 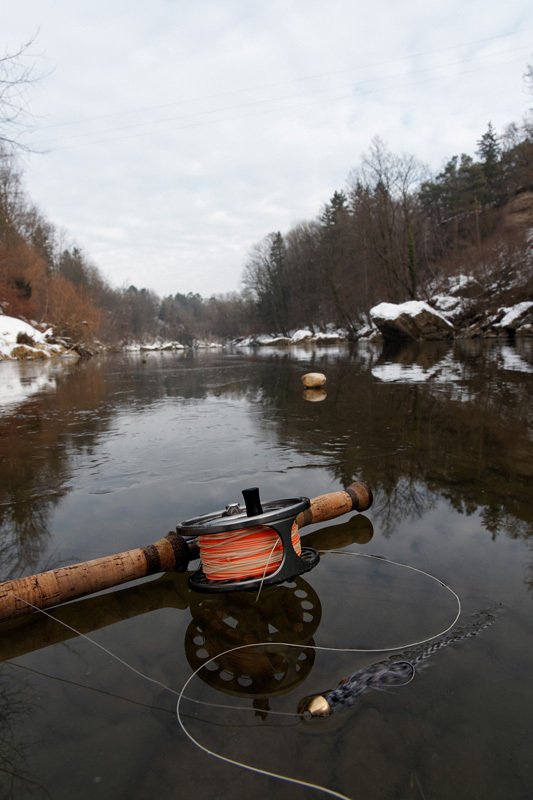 My favourite fishing tool in smaller rivers – a 11 ft switch rod and a tube fly – on thinly frozen ice (River Ybbs). The river landscape in winter can be fascinating. 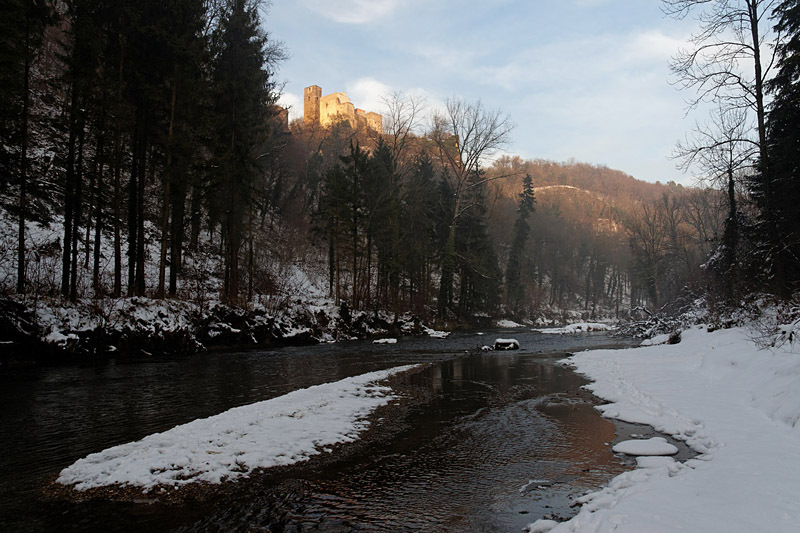 Temperatures are typically -5 to +2 °C in January (River Pielach). A fisherman will have to wait for years to get access to some of the good rivers, and licences can be really expensive (a licence for one year can cost nearly one months salary). 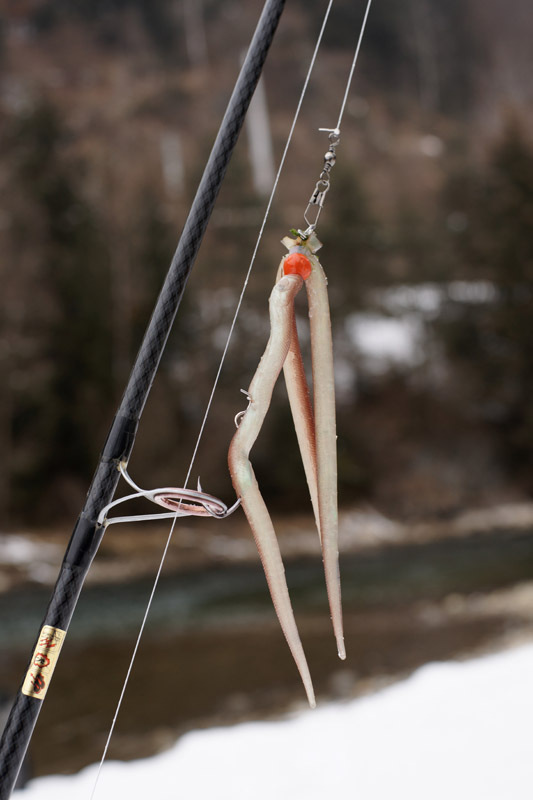 In some river sections, catch and release and the use of a single, non-barbed hook is obligatory. In many others, the size limit is not smaller than 1 m! 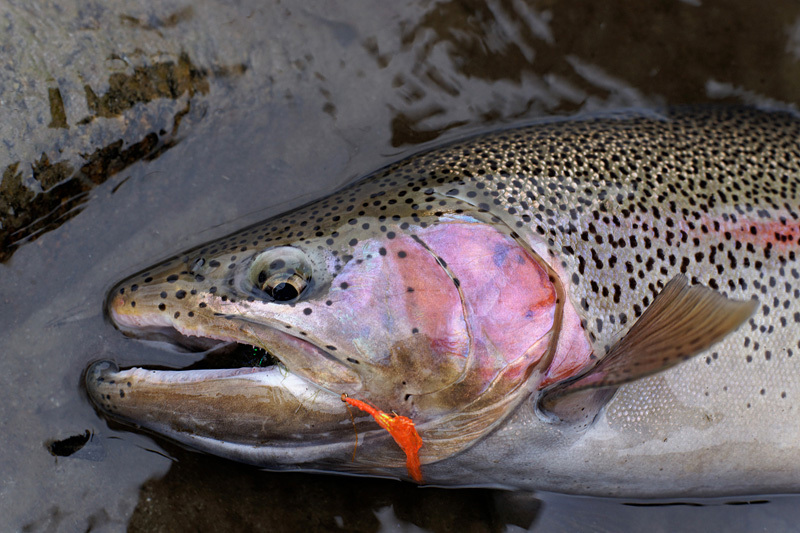 In some rivers, you can take home one fish a year, but you have to stop fishing as soon as you have killed one. This may sound crazy, but it is the only way to preserve a sustainable fishery for a non-abundant, long-lived fish like Huchen. 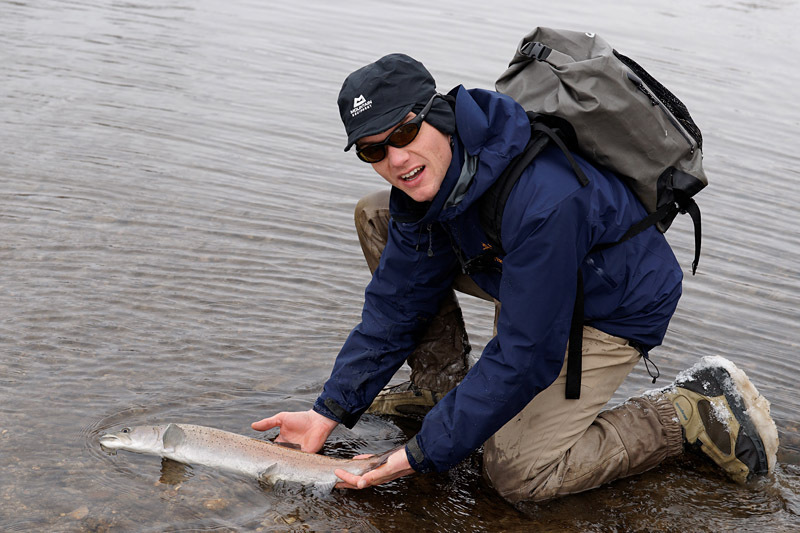 And give the chance to catch such a majestic fish to more than a few privileged river-owners. 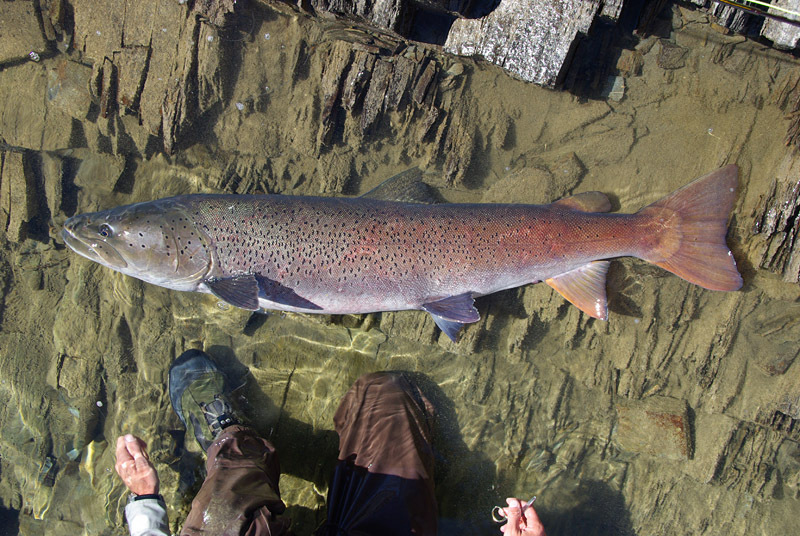 A well-built fish slightly over a meter — probably a female in the best age for spawning. Fish like this should always be released. Mikhail posted a really interesting article about survival of released fish on this page. I can add a personal experience to this topic. 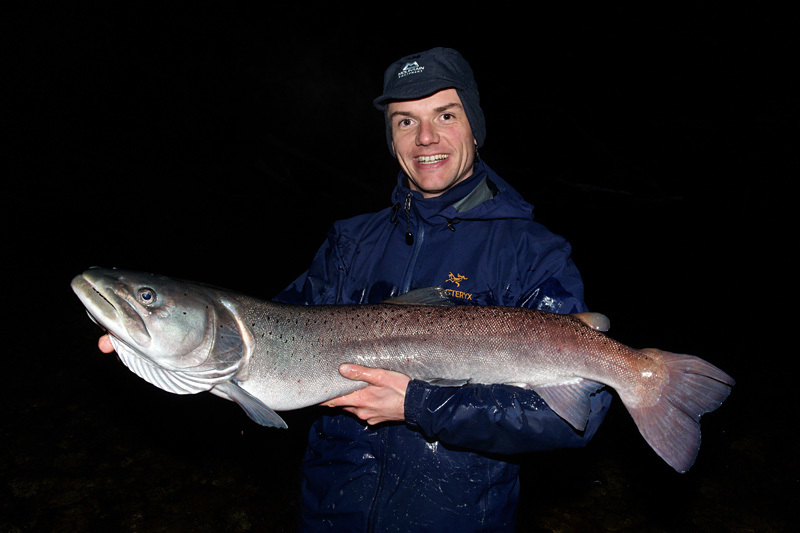 In January 2010, I caught a nice fish of 1,03 m length and probably 10-11 kg of weight (in Europe, we measure total length from the tip of the head to the end of the caudal fin). I decided to release it — which turned out to be a very good idea. In early December — 11 months later, I was lucky to catch exactly that fish again — huchen can be identified by their unique pigmentation pattern. It had grown to 1,10 m and 12,4 kg, which is already a really big size for that small river. Obviously, catch and release really is a good solution that can contribute to better fish stocks and better fishing! 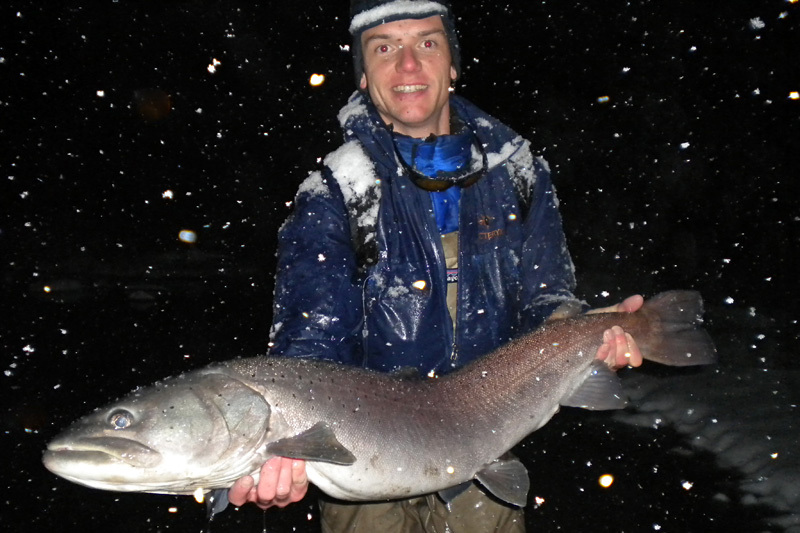 The same fish in December at 1,10 m – it is almost one year older! Compare the black dots! 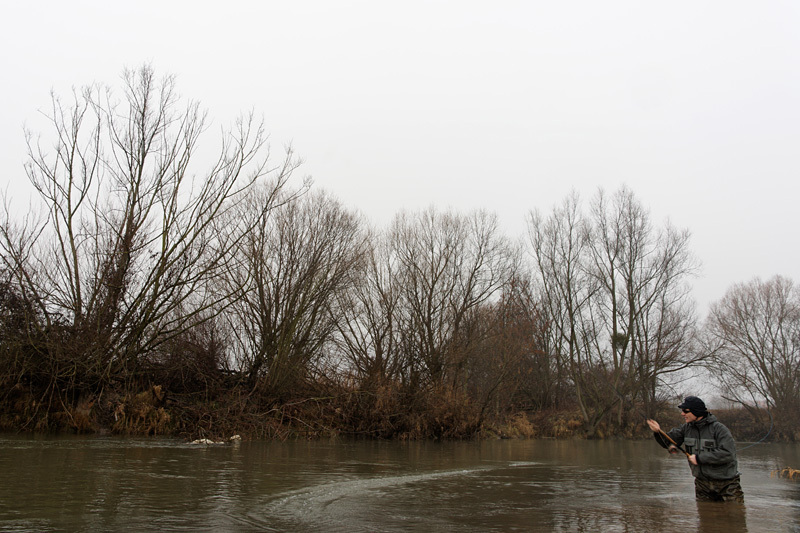 To come to an end, I envy Misha and his friends to live in an area with such natural rivers and fish stocks around. Hopefully, the preservation of fish habitat will be more successful in the Far East than in Europa. I still appreciate Misha’s hospitality during my stay in Khabarovsk a few years ago. Releasing a small fish. Sticky snow on the shoes can make walking difficult. 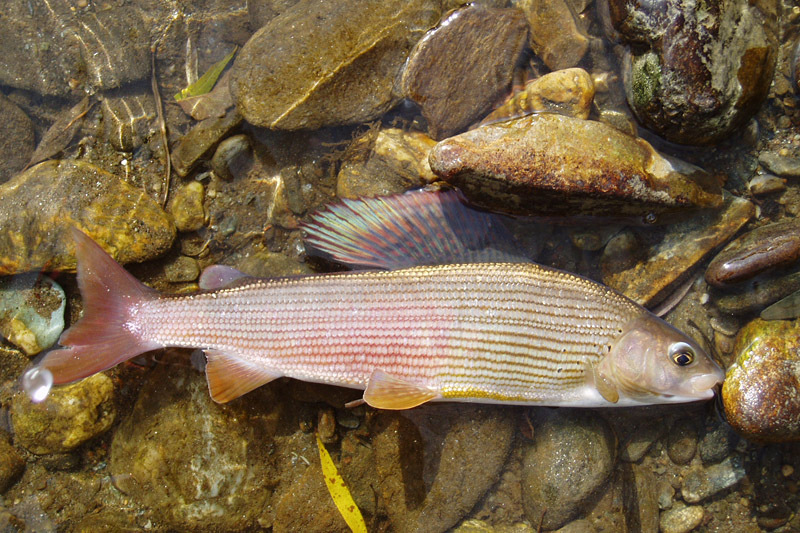 In smaller rivers at low water, sometimes quite small streamers that can be presented very discreet work best. 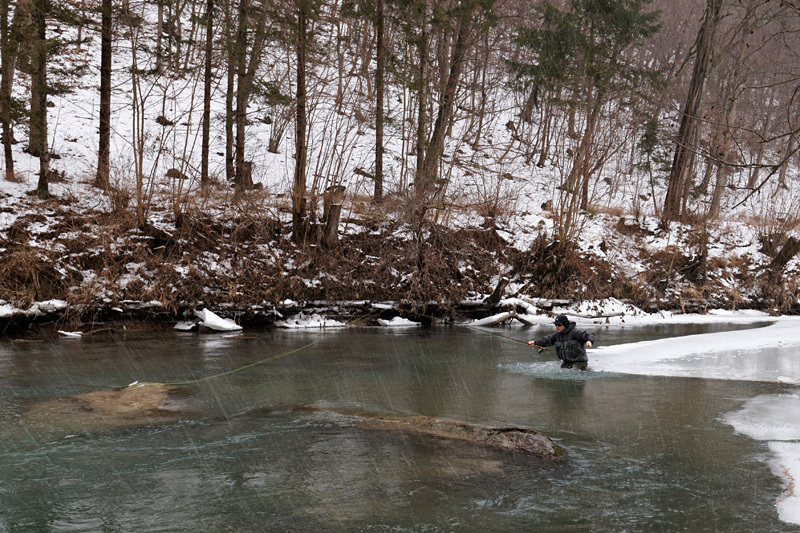 Roman fishing the icy river Mur in January.